Test your apps remotely and interact with the phones as if they're right in front of you! See what we've changed about Apptest and how simple it is to run test cases from anywhere in the world. We extended intaQt’s functionality by providing a remote Apptest feature. Now apps can be automated and tested remotely on devices connected to remote phone services. For example, phones located in Germany can perform Apptests from Austria. This is especially useful when the need to test phones located in a certain country or connected to a specific network arise. 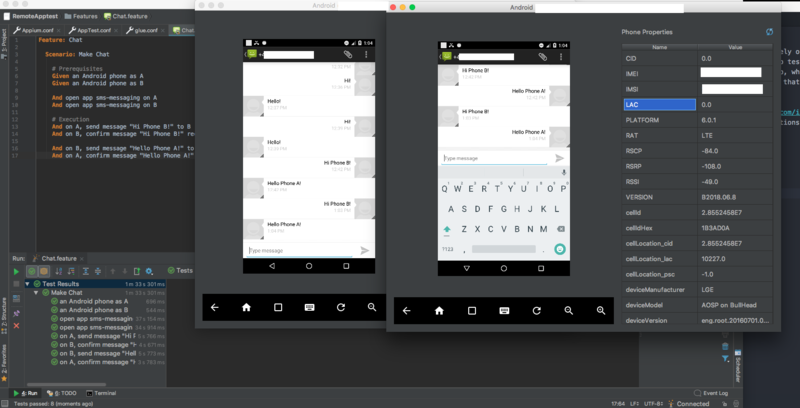 The introduction of remote Apptest coincides with our new intaQt Phone Plugin, which allows users to access all devices within their project so that they can view screens and access phone properties from within intaQt Studio. This means that someone executing a test can see what is happening on the phone in real time. Writing and executing remote Apptests is exactly the same as it was before: Tests are constructed using our UI Steps language, which allows users to control an apps behavior by defining selectors, such as XPaths, CSS and className, and defining what actions to perform on them. Note: For executing test cases that test a phone’s SMS capabilities, you can use intaQt’s built-in SMS Compound Step. Although the example we’re using looks like a phone’s basic SMS feature, it is actually a messenging app. Clicking the Phones tab on the right side of the intaQt Studio editor window allows us to select and view the phones that are being used by intaQt. Even though the phones aren’t in front of us, we can watch and confirm that they are behaving the way that they should. You can even use the Phone Plugin to remotely click, select or interact with the device while the test case is running – although this isn’t recommended, since it could interfere with the test case itself. 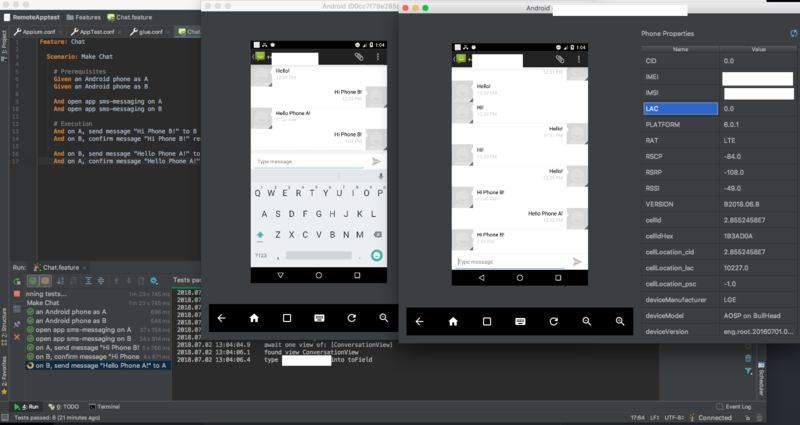 In this article, we showed how a remotely-executed Apptest can look. Although we used a simple scenario, Apptest can be used to automate complex behaviors in areas like Internet of Things, customer service portals, and even games. By introducing the ability to execute Apptests remotely, as well as the Phone Plugin that lets users access a device’s screen from intaQt Studio, testing applications is easier and more transparent than ever before! Would you like to incorporate app testing into your QA activities? Contact us at sales@qitasc.com to find out more!